MicroTech is a Prime Contractor of more than 100 Federal projects and over 25 procurement vehicles. 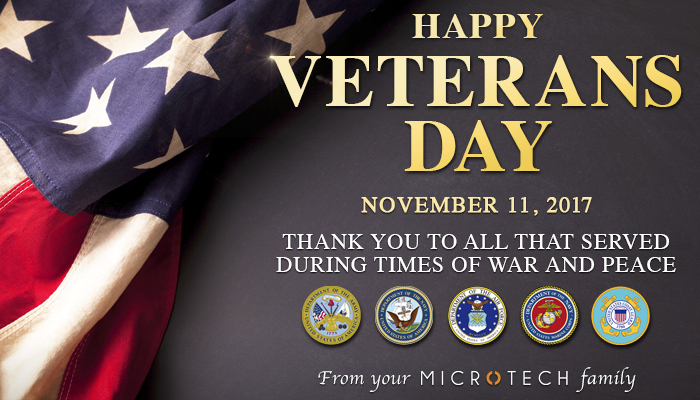 We give thanks to all the brave men and women who have served during times of war and peace to help keep our great nation free. Thank you all for your service! The roots of Veterans Day go back nearly 100 years. In 1938, Armistice Day was officially made a legal public holiday. Many American soldiers lost their lives during WWII and the Korean War. In the wake of these wars, Armistice Day was renamed Veterans Day in 1954. In 1968, a bill was passed which called for Veterans Day to be observed on the fourth Monday in October starting in 1971. The change was part of a move to give federal workers several three-day holiday weekends. But in 1971, two states observed Veterans Day on Nov. 11 instead, and over time, other states did the same. Copyright © 2014 MicroTech All Rights Reserved.